evvnt partnered with Netguru some time ago after having tried multiple different options, including in-house development, and Indian and London’s agencies. 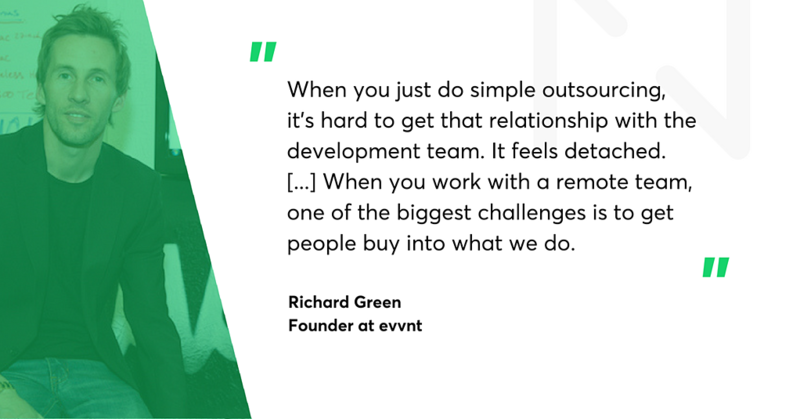 Richard Green, evvnt’s founder, went on a long journey to test different teams and agencies, and the key takeaway was that there was no ideal solution on the market. That said, Netguru proved to be the best out of all the options he had tested. We decided to ask Richard about his business, future plans, and his experiences with a remote team. Natalia Chrzanowska: What are the biggest challenges when it comes to technology and development? Richard Green: The biggest challenge on development side is probably the fact that there are so many rumours and so many different forces around trying to tell you what the right way of doing it is. In London, you should build your own team, you should be iterative, you should be getting very close to your customers. But then if you don’t have enough funding, you won’t fulfil all these requirements. Finances are quite tough too, trying to find the right people in London specifically. Anyone that we want to get is probably gone, and our budget is half of what all the best developers get. Richard: You go looking abroad, so you end up looking at India, because it’s one of the cheapest. However, when you just do simple outsourcing, it’s hard to get that relationship with the development team and the products. It feels detached. If you’re working in evvnt, you get that commitment margin of understanding. When you work with a remote team, one of the biggest challenges is to get people buy into what we do. Natalia: How did you eventually end up with a remote team from Poland? Richard: It took me one and a half years to move to Netguru. I tried India, in-house development, and consultancy – we tried everything but this. Then we came here, and it was our last decision. We were positively surprised. The handover was much simpler that we had thought it was going to be, and the expertise was much better than we’d expected. There are some things that I don’t particularly like that we get forced to do, the developer rotation in particular. We lost a Project Manager, but I understand that there is a little bit of humanity we have to deal with. But it’s good. We met our new PM, we like him. Same as the new developer. We also got a new tester, and he seems OK. We’ve got a good team. The other downside is that you make an assumption that offshore development is cheap. It is not cheap as such, however, the cost is manageable. Being able to scale up or scale down very quickly is very attractive. To get a developer of this quality in London is not far from what we pay here, but within the same price we get a full team – with a project manager and a quality assurance specialist. Natalia: Do you see it as a big obstacle, having your team scattered across different locations? Richard: The development process in terms of managing developers and getting work done is effective. Everyone is very happy with the fact that everyone’s on Slack. But there is something about bringing people together and being able to ask questions, answer straightaway and talk about it in person. I get that on Slack, but it’s still not as good as personal contact. Natalia: Do you think visiting Netguru’s office and meeting up with the team brings more value to the partnership? Richard: You know how it is. We schedule a call, we speak to someone, you send me an email, I’m telling you I’m very busy, and it’s hard to get ahold of someone. But then you come here [to Netguru’s office], and it’s just easy. Every time we come to Poznan, we know we should come back more often, but then it’s suddenly 5 months. It’s challenging. Natalia: What are the next steps now? Richard: We’ve been advised that we’re missing a designer in our team, so we’re going to add one. We’re also trying to complete a project that has been active for a while. We’ve been trying to focus on what’s absolutely required to finish the project. If we can get all that done, we’re also looking at another 2 projects that we want to start. Our challenge, though, is the fact that we have enough work for eight developers, but because we’re not generating revenue from our tech yet, our budget is always challenged. At the moment, we operate with one Project Manager, one developer, and one tester, when we really need 3 more devs. So instead of having 3 projects working at the same time, we have to put them in front of each other which means we have to wait. And I hate waiting. Natalia: What were the biggest achievements so far? Richard: I think our biggest achievement is still being profitable as a technology company. We’ve been around for 5 years, which is very difficult. Most companies raise £150-200 million, and they are still not profitable. We’ve almost achieved the plateau with operations, and we’re just trying to find a tech curve. We need people to self-serve our product online without having to speak to us. Our biggest achievement is reaching the level of profitability and sustainability. We haven’t gone under yet. Natalia: Do you have any recommendations for hiring the remote team? Richard: Meet your team as soon as possible, then come over again, whenever it’s possible. You can validate the team much quicker by meeting up with them versus by communicating through online channels. You know then who you’re going to get and you build the relationship from the get-go. If you want to more about challenges evvnt faced check out the podcast on evvnt's blog.